Four years ago, Eric Ben-Artzi joined the Deutsche Bank AG in New York as a risk analyst. Within a year, he had noticed some sketchy dealings by the bank that seemed to overvalue billions of dollars worth of derivatives. He took his concerns to his supervisors to no avail, and finally decided to file a formal whistleblower complaint with the U.S. Securities and Exchange Commission in 2011. Shortly after that, Ben-Artzi was let go from the bank as part of reorganization. However, this story might still have a happy ending. The SEC is still investigating his whistleblower allegations, and if they prove to be correct, Ben-Artzi could be awarded millions of dollars. This is all because of the Dodd-Frank Act, which was passed by U.S. Congress back in 2010 in an effort to prevent another economic disaster from occurring. One provision in the act encouraged whistleblowers to come forward, partially through financial incentives. Whistleblowers who provided information that would enable the SEC to produce a fine of at least $1 million could be eligible to receive an award equal to 10-30% of the amount of the fine. As a result of this policy, one whistleblower received a reward of $14 million last year for a tip. The SEC’s whistleblower program is far more extensive than most – the Ontario Securities Commission, in comparison, does not have a financial compensation policy in place, though they have spent the last three years pondering over whether they should establish one. So Why Aren’t More Whistleblowers Coming Forward? Despite programs such as the SEC’s, potential whistleblowers are still wary of coming forward. 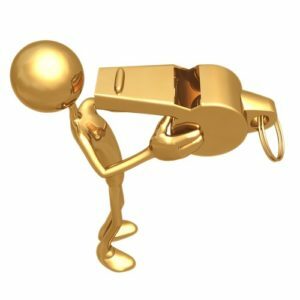 While there may be benefits to blowing the whistle on your company’s wrongdoing, the risks of doing so may be too big. In Ben-Artzi’s case, he’s had a lot of trouble getting back into the workforce. He’s filed a wrongful dismissal suit against the bank to try and get his job back, but in the meantime, other companies have been wary of hiring him. Another major deterrent to whistleblowers coming forward is the bystander effect. This psychological theory claims that the higher the number of bystanders present, the less likely it is that one of them will come forward. Ensure that any potential whistleblowers in your workplace will be safely protected and stave off the bystander effect by implementing an ethics reporting system in your workplace today. If any employees see wrongdoing occurring in the office, they should feel safe to come forward with their concerns without any threat of repercussions.